A suspected dissident republican was murdered in his pub in the first of two gun killings in Dublin within hours of each other. Micky Barr, believed to be from Strabane, Co Tyrone originally, was shot dead in the Sunset House bar in the Summerhill area of the north inner city shortly before 9.30pm on Monday. About two hours later another man, aged in his 30s, was gunned down in a separate gangland-style killing in the Kilcronan area of Clondalkin in the west of the city. After the first shooting speculation immediately centred on Barr being targeted as part of the bloody underworld feud between the Kinahan and Hutch families and their associates. But there have been conflicting reports as to whether he was the intended target or if a member of the Hutch family was in the pub at the time. Witnesses reported hearing three shots after a three man gang, at least one of whom was armed, turned up at the pub where more than a dozen people were inside. The Tottenham Hotspur-West Bromwich Albion Premier League match was half way through the second half when the shooting took place. Local Dublin city councillor Nial Ring was about 300 yards from the pub taking down 1916 posters on the street when the attackers struck. “It was utter chaos, people out on the street,” he said. A man with special needs who had been in the pub had to be carried away from the scene by locals after suffering severe shock. “No-one understands gangland feuds, least of all him, he just went into shock and had to be carried home. It was horrible,” Mr Ring said. Barr, who was in his mid 30s, was living in nearby Ballybough and was due to be sentenced on Thursday at the Special Criminal Court for handling stolen electrical equipment. Earlier this month he pleaded guilty to the offence at Finnstown House Hotel, Newcastle Road, Lucan, Co Dublin on July 18, 2014. Two months earlier at the same hotel a bomb was found in the boot of a car. Barr was not facing any charges in relation to that. He lived in Poppintree in the Ballymun area and also in Finglas before moving to the north inner city since taking over the pub some time in the last year. In November 2014, when charged with the offence, Barr was also charged with IRA membership but the charge was later dropped. The second shooting is not known to be a gangland incident but the victim was shot a number of times and died at the scene. At least one bullet hit the front door of the semi-detached house on Kilcronan Close where the attack took place. A large area of the cul-de-sac in front of the home was sealed off as well as a stretch of the nearby Grand Canal. Underwater searches are planned as efforts continue to find a murder weapon. Organised crime units investigating the first shooting said they believed men entered the Sunset House pub and one of them opened fire. Detectives said a silver-coloured Audi A6 car, partial registration 04C, was later recovered in Walsh Road, Drumcondra, and has been seized for technical examination. Prior to the car being recovered, it is believed three men left Walsh Road in the direction of Home Farm Road in another silver-coloured saloon car. The two sides in the murderous Kinahan-Hutch feud have carried out a series of attacks in Spain and Dublin which have claimed the lives of at least five people since late last year. The Sunset Bar is about a mile from where Martin O’Rourke, an innocent father and former drug user, was shot dead just over a week ago. He was caught in the crossfire in Sheriff Street as another murder bid linked to the feud was launched. That in turn was a mile or so from where taxi driver Eddie Hutch, brother of Gerry “The Monk” Hutch, was shot dead at his home off North Strand in February. The Kinahan-Hutch feud spiralled into a killing spree when Gary Hutch was shot dead in an apartment complex near Marbella on Spain’s Costa del Sol last September. His killing is believed to have been avenged in the Regency Hotel attack, an audacious shooting spree with assault rifles in early February which claimed the life of David Byrne, an associate of the Kinahan family. Within days, Eddie Hutch was dead, and, at the end of last month, Noel Duggan, an old friend of suspected armed robber Gerry “The Monk” Hutch, was shot dead at his home in Ratoath. Mr Ring said: “People are now talking about a guy shot at work, a guy shot in his home and a guy shot on the street - nowhere is safe. Fianna Fail pledged to raise the issue of Garda resources when talks on a minority government resume. 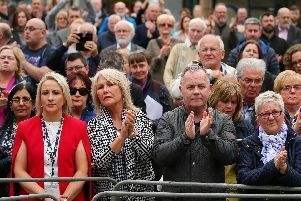 The party’s justice spokesman Niall Collins condemned the killings but questioned if promised resources were being seen on the ground. “Back in February, the Minister for Justice (Frances Fitzgerald) announced five million euro for a task force to tackle organised crime. Since then we have seen more violent killings as the war between feuding gangs escalates,” he said.